Some non-United States citizens who hold work visas are eligible for green cards – and that means they get to live and work permanently in the U.S. Other than family-based green cards, employment-based green cards are the most common ways for foreign nationals to obtain permanent residency here. What is an Employment-Based Green Card? If you’re a foreign national living in the U.S. on an H1B or student visa, or if you’re currently residing outside the U.S., you may be eligible for employment-based green cards if an employer sponsors you. You and your employer must follow a specific process so you can get this type of green card, and your employer must provide proof of a labor certification and several other documents. Applicants who live in the U.S. on a visa can apply for adjustment of status to obtain an employment-based green card. People who live outside the U.S. can go through consular processing instead. EB-1 priority workers are people of extraordinary ability in the arts, sciences, education, business or athletics, as well as outstanding professors and researchers who have received national recognition for achievements in their fields. Priority workers also include multinational managers or executives. You must meet certain criteria to qualify as an EB-1 priority worker, which your employment-based immigration lawyer can explain to you. EB-2 professionals with advanced degrees and EB-2 persons with exceptional ability must be applying for a job that requires an advanced degree, or must be able to show exceptional ability in the arts, sciences or business. 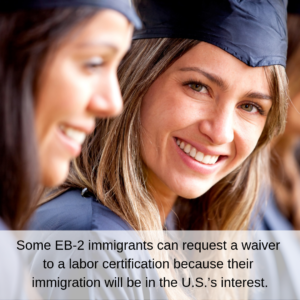 Some EB-2 immigrants can request a waiver to a labor certification because their immigration will be in the U.S.’s interest. These immigrants don’t need an employer to sponsor them and can file directly with U.S. Citizenship and Immigration Services. In order to qualify for this type of green card, you must provide documentation that proves that you have at least 10 years of full-time experience in your occupation and that you’re licensed (if necessary) to perform it. Your attorney can help you determine what other documentation you need. EB-3 skilled workers and professionals, as well as some unskilled workers, often qualify for green cards based on the needs of U.S. employers. Skilled workers must demonstrate at least 2 years of job experience or training, and professionals have to provide proof that they have a U.S. baccalaureate degree (or a foreign equivalent). Unskilled workers must be capable of performing unskilled labor that’s not temporary or seasonal. In every instance, employers must certify that U.S. workers are not available to perform the job. If you fall into one of those categories, you could qualify for an EB-4 special immigrant visa. For most people, it makes sense to discuss specifics with a Dallas immigration attorney. EB-5 investors can apply for a green card if they plan to create or preserve 10 (or more) permanent full-time jobs for qualified U.S. workers and make the necessary investment in a commercial enterprise in the U.S. It must be a new commercial enterprise (one that was established after November 29, 1990 or one that was established prior to that date but has been restructured, reorganized, or expanded). If you intend to invest in a U.S. company to gain a green card, it’s a good idea to discuss your options with a U.S.-based immigration attorney. Your lawyer will also explain the requirements you must meet to qualify, which can include a minimum investment of $1 million. What is a Labor Certification? A labor certification is required for most U.S. employers that want to sponsor workers for a green card. It’s issued by the Secretary of Labor. The certification assures USCIS that there isn’t a U.S. worker available to fill the position and that hiring a foreign worker will not adversely affect U.S. workers who are similarly employed. Certification is based on circumstances at the time of application and the location of the position the employer wants to fill. That means that if the position is in Dallas, the Department of Labor can certify that there aren’t enough workers who are capable or willing to take the job in Dallas – the conditions in other cities don’t matter. Can Your Family Get Green Cards Based on Your Employment? If the U.S. government grants you an employment-based green card, your spouse and children who are under 21 at the time you receive your green card can also get theirs. People who are currently working for an employer on an H1-B visa may be able to apply for permanent residency using an adjustment of status. However, those who are not already working for an employer or who are located outside the United States must go through consular processing – the process of obtaining residency through a U.S. Department of State consulate abroad. Do You Need to Talk to a DFW Immigration Attorney About an Employment-Based Green Card? We may be able to help you. Call us at 817-529-4509 to schedule your consultation with a DFW immigration lawyer today.